BON AIR. VA / MJBizwire / August 5, 2016 — Farm to Vape LLC is pleased to announce the release of 4 new all natural flavors to compliment their unflavored Thinner products. These new all natural flavors are: Raspberry, Orange, Mango, and Strawberry. Farm To Vape’s product line has long been recognized as the purest and easiest mixing agent on the market designed to help people break down their own herbal concentrates and essential oils into a stable eliquid for all styles of vaporizers, and this tradition continues. From the beginning Farm To Vape has created nicotine free products that were designed from the ground up to allow people to mix their concentrates into eliquids, and a common desire with these mixes has been to dial in the right flavors and aromas. In an effort to help people dial in just the right flavor Farm To Vape has designed its 4 new flavors to using only all natural flavors that can help to align these aromas with the existing flavor profiles in their concentrates. Mango and Raspberry flavors lend a strong and powerful aroma to the vapor that these mixes will produce. Strawberry and Orange create a mild flavor profile to help add greater depth of flavor to these mixes. By releasing 4 distinct all natural flavors Farm To Vape can help customers dial in the perfect flavor and still be able to produce the most stable and pure eliquid possible; regardless of the density of their concentrates and essential oils. Farm To Vape continues to lead the industry in nicotine free products for mixing your own concentrates, and the addition of these 4 flavors adds additional variety to their diverse lineup of products. 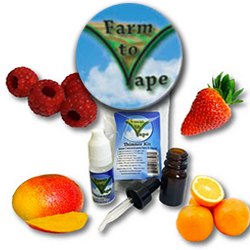 Farm To Vape products are always manufactured to the highest standards in an ISO9001:2008 facility, and made only with NF and FCC rated ingredients in the USA. All flavors are available in 10ml, 60ml, and 1 gallon sizes, and of course in their famous kit. Wholesale, distribution, and licensing opportunities are available. For more information, contact Brendan Kennedy at 804-601-8432 or brendan@farmtovape.com. 2711 Buford Rd #303 | Bon Air, VA 23235-2423 | Vape what you want, when you want, Farm to Vape.